To introduce, increase knowledge and build capacity in the production and utilization of Orange Fleshed Sweet Potato among farmers in 5 local government areas (LGAs) in Kano state. 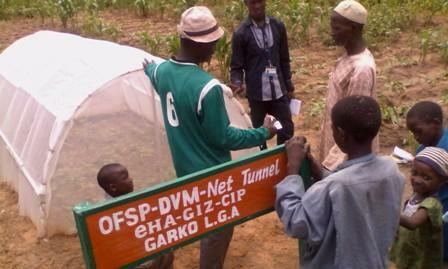 A completed net tunnel with sprouting OFSP vines, 2 weeks after planting in Garko LGA. This project was the first of its kind to introduce orange-­fleshed sweet potato (OFSP) into Kano state, Nigeria as a way of diversifying the local diets and improving nutrition. Orange-fleshed sweet potato (OFSP) varieties Contains Beta-carotene, a precursor for vitamin A, which is known to reduce the rate of diseases and deaths in children 0-5 years by 29%. One small root of OFSP, weighing 125 grams, can supply the recommended daily allowance of vitamin A for children and non-­lactating women (300-­700 micrograms Retinol Activity Equivalents (RAE). As a result, the cultivation of OFSP by smallholder farmers and the utilization and consumption of OFSP foods were enhanced in 5- targeted LGAs in Kano state; Bunkure, Dawakin Kudu, Garko, Bichi and Garum Mallam LGAs. 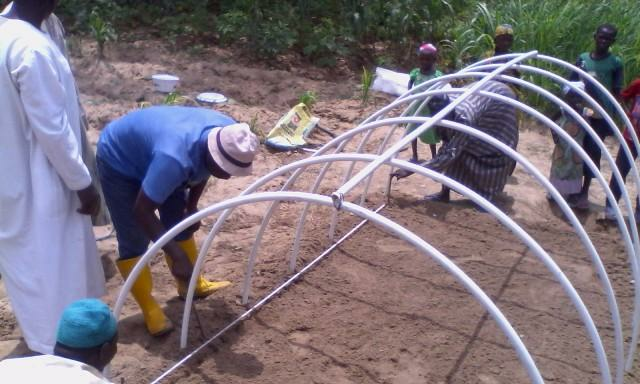 eHA delivered this integrated agriculture and nutrition intervention in collaboration with Kano state Agricultural and Rural Development Authority (KNARDA), International Potato Centre (CIP), and Women Farmers Advance Network (WOFAN). The project was implemented as part of the diversification component of the Walmart funded German cooperation (GIZ) project, known as the Competitive African Rice Initiative (CARI) project, which was focused on improving local rice production in Nigeria. Training on the production and utilization of OFSP for extension agents. Radio news broadcast of OFSP extension messages. The GAP training, attended mainly by the male farmers as well as the awareness campaigns has Increased farmers’ knowledge and practical skills needed for increased production of OFSP. Women farmers, through the Nutrition and utilization trainings were made aware of the benefit of OFSP to their families’ healths and ways of utilizing OFSP in a variety of local dishes to boost Vitamin A intake of family members. The training also covered the utilization of OFSP for making commercial products as an additional source of livelihood. Vine multiplication provided an additional source of income to selected farmers who had been carefully selected based on strict criteria. The vine multipliers utilise the net tunnel technology to continuously produce quality declared OFSP planting material for farmers throughout the various seasons, and as such encourages the sustainable production of OFSP in the target LGAs all year round. The project has successfully built institutional capacities among government extension agents in the selected LGAs through a TOT thus, providing resource persons within close contact with farmers to serve cluster groups in the LGAs beyond the project duration.